A Zimbabwe deadline for all firms to transfer most of their shares to black Zimbabweans has passed, but it is not clear how many have complied. The government had said that companies should meet the requirements of a 2008 indigenisation law by the end of March. Theoretically, non-compliance could lead to a company losing its license. This was a key part of Robert Mugabe's 2013 election campaign - on the basis that black people were discriminated against during the colonial era. But it has proved controversial, with detractors saying that it could discourage much-needed foreign direct investment. The Reuters news agency quotes the minister responsible, Patrick Zhuwao, as saying that most of the country's foreign-owned banks and mining companies have not submitted their indigenisation plans, adding that he thought they would do soon. But Mr Zhuwao told the BBC's Focus on Africa programme that his ministry was currently "going through submissions made by companies [and] we don't have statistics yet" on who has complied. He dismissed concerns that the measures would scare off foreign investors. "Those statements come from voodoo economists," he said, "and these statements are really very far removed from reality." He added that the "law is attempting to negate the imbalances that were created by racism as a result of our colonial history". 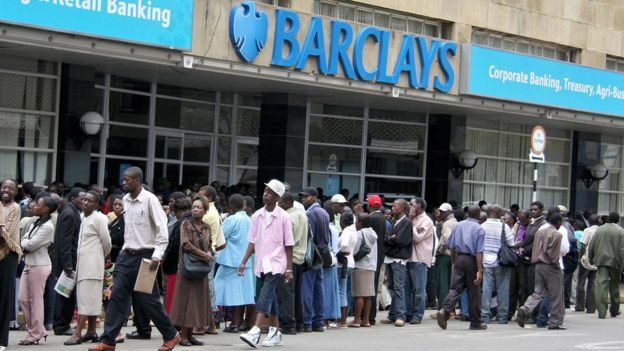 Standard Chartered and Barclays are among the banks operating in the country, and Zimbabwe also hosts the mining firms Anglo American Platinum and Impala Platinum. BBC Africa Business Report editor Matthew Davies says that an attempt to implement the law two years ago was largely ignored, but this time the government is promising action. The indigenisation plan for businesses echoes the country's land reform programme that started in 2000. At that time, the process of transferring around 4,500 farms held by white commercial farmers distributed to nearly 170,000 black Zimbabwean families began. This has been widely blamed for causing Zimbabwe's economic collapse, but a 2010 study by Sussex University found that the programme had had some positive effects, and that the idea that it was a complete failure was a myth. Zimbabwe is currently coping with the impacts of a severe drought.